Santa Carla is an unassuming shop tucked away in Sparta Place – a pedestrian enclave of cafes, galleries and specialty shops that feels out of place amidst the bustling bridal district of Sydney Road. The first time I stumbled across it I felt like I had walked through a secret door into Narnia. Down the street from Santa Carla is a dog bathhouse where a canine blow wave treatment costs more than most human’s haircuts. To brand Santa Carla as just a bookshop would be misleading of me. As well as books and comics it also stocks art, jewellery and gifts. The shop has a manifesto – championing independent work, mainly from Melbourne but also from outside Australia. It stocks only independent products and supports artists in the community by holding book launches and exhibitions. The idea for the shop came from the owner Jode sitting around with her husband one night talking about all their favourite independent artists and producers. ‘We were talking about how great it would be if there was a shop that sold all our favourite artists’ work, 100 percent independent stuff.’ As we wandered around the shop together, Jode told me the story behind almost every book, graphic novel, and comic collection displayed on the shelves and tables. Every single product had a story. What sets Santa Carla apart from other bookshops is that Jode and her husband are so discerning with what products they stock. The result is a tightly curated collection of books and comics that give the shop an almost art gallery feel. They stock novels which are either fall, independent presses or self-published by the authors themselves. The focus is mainly on genre works, ranging from fantasy and sci-fi to noir. I didn’t recognise any of the covers I was browsing through, and I liked it. The prospect of being able to discover something I had never come across before and take it home with me felt special. The graphic novels and comics on display encompass a range of art styles and genres. Interestingly, the comics are organised by audience age. The comics for all ages are displayed on one side while the comics for a more adult audience are up the other end, safe from children’s prying eyes with the counter as a handy buffer. ‘We generally don’t let children behind the counter so they don’t accidentally see something too old for them,’ Jode says. All the comics are independent and quite niche, so if you aren’t a comic aficionado you probably won’t recognise any titles, but if you ask Jode or her partner will explain their themes and stories, and recommend a series for you to try, just like they did for me. So next time you’re in Brunswick and looking to escape the throng of bridal gowns and wedding invitation templates on Sydney Road, duck into Sparta Place into the world of independent art in all the many forms that art can take: stories and drawings, prints, jewellery and even DVDs, put together lovingly by passionate people. You could find something unique with a story behind it to cherish, take home with you, or give to a loved one. Or you could just find a really cool tote bag. The amazing team from The Morning Bell Podcast have been the pioneers of Speculate, and I’ve been lucky enough to join them on this voyage. With the festival coming up this Saturday, and my time volunteering about to come to an end, this is the perfect time to look back at everything that has shaped my experience. Building and maintaining work relationships with a range of individuals has been my main role. I need to anticipate communication issues before they happen and make sure we’re all on the same page. If not, I need to turn back a couple pages and see what happened. As I am the main contact for the guests and their publishers, I’m mostly sending emails for clarification and information about specific tasks and the event. We had sent out a call for volunteers and worked in collaboration with Swinburn University. Specifically, I attended their lecture as an industry contact and was answering questions about Speculate. This year was my first appearance on the Morning Bell Podcast. I joined as a member of the Speculate team where we discussed the festival and speculative fiction that has left a lasting impression! Our goal is to celebrate the genre with our guests, staff and lovers of speculative fiction. There’s a lot of work by a lot of different people, and many hands make light work! I’ve been a part of organising book launches in the past but preparing for the festival was on another level for the sheer amount of people we needed to be in contact with. It’s always a useful skill to pick up something that might cause grief later and come up with a solution! This is the first time we’re all running a festival together and keeping up communication was my task. There have been mass emails and individual ones, ones that have been drafted and looked over by multiple people before it goes out. If you’re going to talk to all these guests, you need to read everything you can! I’ve had a long list of books to read before the festival and had already read some of our authors works. If you’re in need of recommendations, have a look at their current works! Tomorrow the months of preparation will finally be over and the festival itself will begin. We’re excited to share everything we’ve been working so hard to get together. We hope you can join us on this spectacular day! What: The Victorian Speculative Writers Festival. The first! Writing is hard. Annoyingly hard. I think many writers can agree that we are our own worst enemies, picking apart everything that is wrong with our words. I have rewritten one character’s story four times now, or at least, the beginning of it. I rarely get past the 5000-word mark, before hating the plot because it’s not right, despite the days of planning I do for it. I think to myself, ‘Does this fit a genre? Would people even like it?’ I try to break genre conventions and tropes, to make them more unique, but always wonder whether I should just try to make it easier for myself instead of coming up with outrageous plots and characters? There are two core issues happening to me here – one being I simply haven’t written enough. I am still an amateur writer, struggling to find where I want my future book to be in Dymocks. The second problem, is the one I want to talk about: writing to trends. I see the question ‘Should I write to trend?’ a lot on writing forums. After all, it could be an easy pay check, or make your chances of being picked up by a publishing house more likely. But is it easy money? In a sense. 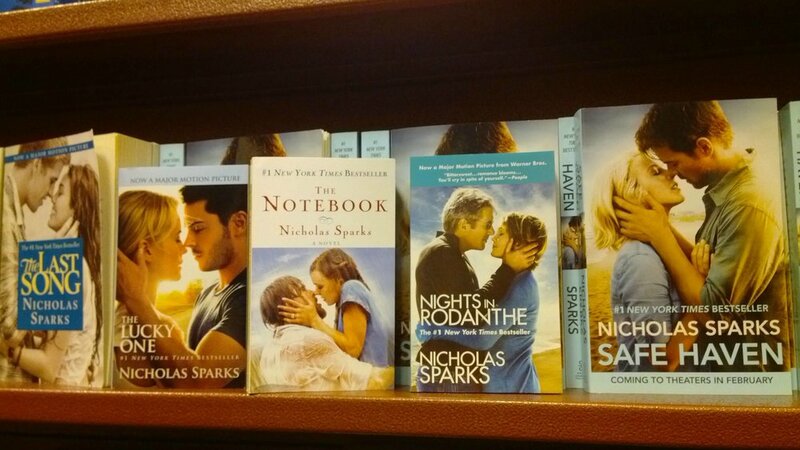 It’s not secret that romance and erotica do extraordinarily well as ebooks. They dominate sales, and a simple search on Amazon will give you thousands of results. A writer could bomb out a romance novel, chuck it up on Amazon, and boom, you’ve just earned yourself some pocket money (note: I say pocket money here, because the reality of self publishing is you will earn very little. The people demand free ebooks, or generally only will buy them at $2.99, any more than that and you better be a bestselling author). So sure, writing to trends can shorten the wait time for payment. No doubt when Twilight became an international success, many other vampire love stories would have sucked the life out of Amazon. I’m also sure they would have made decent money, as people were still on that vampire-high and wanted more. Okay, so writing to trends may work for ebooks and self-publishers. What about traditional publishers? Those amazing dudes who make your pieces of paper turn into a 400-page book, with the beautiful tagline: ‘by Début author [insert name here]’. Publishers make it no secret that they’re always looking for the next trend, the next author who will make them the big bucks. So if you pay attention to the market, the book sales, analyse how people are feeling and what they are wanting, you could write the next trend. You can even analyse agents on their websites and Twitter, who will often list all the manuscripts they will instantly toss away because of the genre. So traditional publishing could work as an option as well. They want the new trends, they want the shining author who delivers it to them. But I’m not writing this to argue that you have to write to trend to get anywhere as an author. I claim the opposite is true. Writing is something we love doing. Even as I slave away over a story that I’m never happy with, I still love the process. I still love the character. And though it may not be completely conventional, able to fit neatly into a little box labelled ‘sci-fi’ or ‘fantasy’, the idea of removing those aspects that I love in order to fit that box—well, that I hate. Writing to trends becomes repetitive work. You’re pumping out the same story, the same plot, over and over again. Sure the title has a new name, characters are called something else, but you know it’s essentially the same as the last story you did. That stumps creativity. Eventually, I will get this damn book finished. One day I will get past those infuriating 5000 words, and keep writing. And it doesn’t matter how ridiculous it is, or if it will never get published anyway, because it will be worth it. Writing to trends is easy. But we don’t like taking the easy route. We don’t want to take the bland shortcut on the street. We want the scenic route, the one that encourages us to stop and take a moment. And if we get to the party an hour late, who cares. Everyone always arrives to a party late anyway. People just don’t speak clearly. When we speak, we treat words badly. We never finish our thoughts, leaving half-sentences stranded everywhere. We compress and stretch words like elastic bands, you betcha we do. None of this matters in everyday babble, but when you’re transcribing, each quirk is a little roadblock in the way of comprehension. And, specifically in my job transcribing police interviews, these quirks of language affect the meaning and possible interpretation of each case. 1, Q: John, why did you go to that house last night? A: I went to that house, to be honest, with her. 2, Q: You went with her? A: No! I went to that house to be honest with her. It’s clear that in the first case it seems the subject is saying they’re being honest about going to a house with a woman, yet they then clarify they went to a house to be honest with a woman. The presence of two little black blotches easily bent the language. So, the job isn’t really just typing, it’s about communication. It’s the largest, challenging, and at times confusing part of the job. It’s asking yourself: what’s really being said here? Q: - - - you do? A: - - - Bachelorette. I love that show. Or, when someone speaks in a series of jumps, repeats themselves, or wanders off on other ideas mid-sentence, we denote it with a single hyphen. Q: So you weren’t at - at the bank? A: No, I was at the - no, wait, like I said, I was watching The Bachelorette. I mean, Sophie Monk, I - I - sorry, I just have a lot of - look, I have a lot of feelings for that woman. A: I’d never miss a - look, can we change the subject? None of this is particularly noticed during the common flow of conversation. It’s really how we move from topic to topic, sort of haphazardly jumping around as ideas ping off in our heads. Yet, on the page it’s strikingly apparent, and also essential to transcribe properly. Q: O.K. So, you were watching the Bachelorette then. A: - - - like, she’s a total legend, yeah. I mean, I just know, like, I didn’t assault anyone ’cause, like, you know, I’d never miss an episode, yeah. We don’t realise it at the time, but it’s our way of giving ourselves a million little breathers to understand what the hell we’re talking about. Fillers such as ‘like’, ‘yeah’, ‘I mean’ and ‘well’ are really just the spoken equivalents of the comma. And it’s these little words are both infuriating and interesting parts of the job. Particularly because of a phenomenon termed ‘perceptual restoration’, where our minds predict words two-tenths of a second before actually hearing them. It’s useful for everyday speech, allowing us to understand each other even with peripheral noise and interruption, but it’s a constant road-block when transcribing. When checking my work, I’ll always find buried innumerable little words—usually innocuous ones like ‘was’ or ‘and’ – but words that were never actually said. My brain just makes them up, filling them in like holes in a wall. While these seem irrelevant to transcribe, they constitute the character of a person. It can reflect an attitude, a personality, a regional dialect, a class, and/or an education. As well as everything I’ve mentioned, it’s the malleability of someone’s language that can indicate a breadth of information about them. Beyond this, the fickle nature of how we speak can distort language right down to its smallest parts. So being a transcriptionist is like being a studier of insects, kneeling down on all fours with a magnifying glass, parsing apart one word from another. 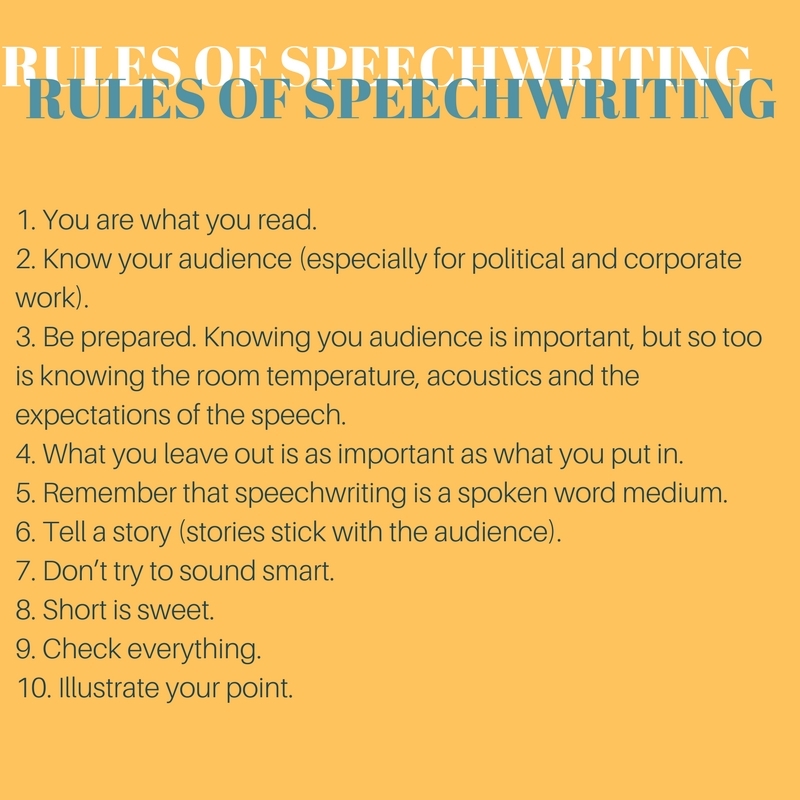 I’ve been interested in speechwriting since I started listening to political podcasts produced by Crooked Media, a media company founded by former Obama aides and staffers. Two of the company’s founders were speechwriters by trade – Jon Favreau served as Obama’s head speechwriter from 2005–2014, while Jon Lovett was a speechwriter for both Hillary Clinton and Barack Obama. They offer a perspective on US politics which is as informed and intelligent as it is funny, and piqued my interest in speechwriting as a profession. There’s nothing better than listening to a good lecture, delivered by someone who really knows their stuff. Luckily for me, the guest lectures delivered at the BSP (or the classes that run in conjunction with the BSP) feature a roster of professionals across the publishing industry, all of who clearly know their stuff. Joel Deane, a poet, novelist and speechwriter, was one of our wonderful guests last year. His talk focused on his work as a speechwriter, but he looked like a poet (with long curly hair and a patterned button-down shirt) and when he spoke it was evident that poetry was his reason for writing, the thing that he loved. Speechwriting was his day job and one that he credited poetry with helping him to find, as having a portfolio of written work and a writer’s understanding of how language works is what led him into his first speechwriting job. My greatest take-away from the guest lecture and time engaging with speeches is that in speechwriting the stage is always greater than the page. Five minutes of a delivered speech is roughly equivalent to 500 written words but the success of speechwriting is more dependent on the delivery of the words than the words on the page. Speechwriting is essentially writing for an audience through an indirect conduit; what is heard by the audience is more important than what is written for the audience. In speechwriting, you are writing for someone else’s voice and that includes taking into account the tempo of their speech and the vocabulary that they use. The particulars of speechwriting could easily be applied to all forms of writing, which was evident in Deane’s speech and his work. So whether you want to craft speeches that will change the world, or just need some extra guidance in your writing, here’s a list of the top 10 things you should keep in mind. What happens when the first publication you ever make is supposed to represent an established and iconic Australian brand? The parameters for my semester one project seemed simple: create a magazine under the banner of The Lifted Brow – Australia’s own attack journal heavyweights. Myself and five others were instantly drawn to this project. Our magazine was to have the same mix of art and words as well as the familiar, legitimate layout of TLB with bold fonts, creative titles and big names. This was the second year of the project, the team before us created Tongue in Cheek: The Mouth Issue a play on the pun with articles on all things related to the mouth: voice, freedom of speech, fun facts about teeth and a naughty mouth-related how-to. Naturally, our first task was to brainstorm; what are we interested in, right now? For me, life was overwhelming. I had recently moved back to Melbourne from a two-year hiatus overseas and at my country home and was embarrassed by how little I remembered the public transport system and social scene. I was feeling nostalgic for my all-too-recent days spent on a lawnmower or in the garden at my next-door neighbour’s farm, picking kids up from kinder and cooking in bulk. Serendipitously, others in my group felt a similar sentiment. Bec recently had an alarming realisation that she was experiencing life through a snapchat filter, Dean saw politics going backwards, Tessa felt as though going back to her suburban home town was like going back in time, Lauren was amused by rules and advertisements of a bygone era and Clare was passionate about living a slow life. We bounced around ideas of nostalgia, recurrence and déjà vu and, tying in with last year’s The Mouth Issue, we landed on The Back Issue. We took our neatly packed idea to TLB’s publisher Sam Cooney, who was also (thankfully) our mentor for the project. He immediately sensed the tight boundaries we’d put on our magazine and encouraged us to make it broader – it could be anything we wanted it to be. A guiding mission of TLB is to publish and champion work from those in the margins, be they literary, demographic, socio-political, age, viewpoints and so on. He was worried that The Back Issue would be too restrictive on submissions and that we were establishing a narrow ladder for future BSP students to climb. This was how we landed on The Comeback. While we loved our theme, we didn’t have to be wedded to it, allowing ourselves to be guided instead by our own mission statement. ‘We are a platform for established and emerging artists – our pages are open for second chances and pieces that have been previously rejected. We are breaking the barriers of publishing, unpicking the art and culture around us with a quizzical/critical eye’. The actual look and feel of TLB governed a lot of our pitches, both our own and around Australia. 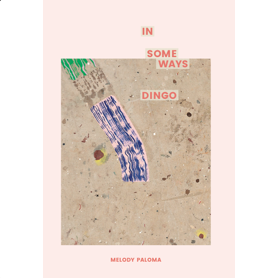 Pieces were playful with an informed edge along with poetry, fiction and deeply-engaged nonfiction that were unpredictable and sometimes provocative. We knew we had the privilege of representing an already established platform and used this to bring big names such as photographer Prue Stent and writer Anna Spargo-Ryan on board. This way we could publish new writers and artists (including ourselves) alongside well-established ones. Being under The Lifted Brow brought in way more submissions than we’d expected. People were excited to be published in association with TLB and we all felt (quite a daunting) responsibility to their work. To the outside world, we were part of TLB, a brand fourteen years in the making. But in reality, we were six twenty-somethings, four of us brand new to the course and all of us new to making a magazine. This was our first real-life dabble in structural editing, copyediting, creating a layout and proofreading. Though we were students, we had to show utmost professionalism, especially on behalf of TLB. Sam reminded us of this and shared his resources at every opportunity. We got to learn directly from TLB’s own schedules, flat plans, style guides and reading reports – an opportunity usually unheard of in student publications. We were reminded to respect the writer, providing a community and support network for ourselves as new editors and our new writers. A writerly way of morale-boosting. Little things like confirming receipt of works, giving rough estimates of timelines and thanking writers were all important reminders around how daunting it is for someone to submit work – referring at all times back to our mission statement. The artwork in our magazine is a defining point for The Comeback. In the beginning, we had all sorts of ideas around retro artworks mixed with modern photography which spurred quite a visceral reaction from Sam. With years of experience he immediately knew what would look good, and especially want would endure. He encouraged us to come up with an ‘art style’, ensuring a cohesion between artworks and written pieces. In the end, our pieces reflect an Australiana childhood and memories of a pre-digital age. We’ve used watercolours and photographs taken in the bush and are proud to see this represented on the page. TLB established itself as from Australia and the world at a time when a cultural cringe saw Australian art and culture as inferior. We like to think we take the same stand. 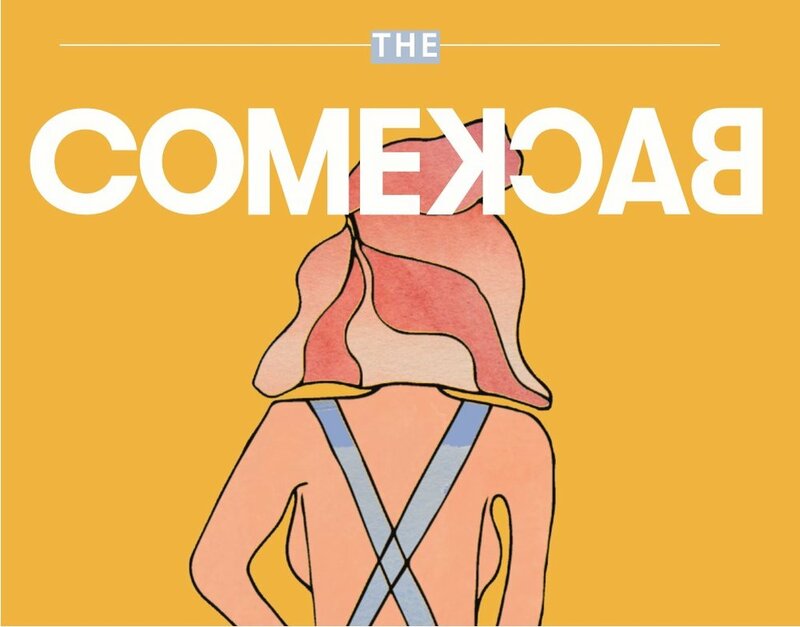 The Comeback represents a diverse range of voices and artists from Melbourne, country Victoria, Queensland, Russia and beyond. Each work showcases the individual who wrote it/made it and all together they form a highly visual and enjoyable read. Check us out, we’re that mustard magazine with a girl’s back(side) on the front. My first team project in the BSP was Rabbit, a nonfiction poetry journal, with poet series. The team worked alongside the founder of Rabbit, Jessica Wilkinson, on: Issue 20 Dance, Issue 21 Indigenous, Poet Series 8 P(oe)Ms, and Poet Series 9 In Some Ways Dingo. Communication was our first hurdle as we hit the ground running in our first week with Dance. This included communication around proofreading, typesetting corrections and redesigning the cover. We started a style guide for future projects, and entered the world of permissions, dpi (the image quality once printed) and communication with designers and printers. Memo: always keep communication flowing and keep yourself updated. P(oe)Ms came to us at an earlier stage in the publishing process. As we received text and images we created a flat plan that helped us organise where on the double-page spreads they should sit. We researched style sheets, editorial and cover briefs, earlier anthologies and poet series so that we knew where all the images and text should be. Any changes to a flat plan after typesetting means more mark-up and potential introduced errors. Memo: use a flat plan and know what each double-page spread will look like. We started our work with referencing and style guides, then took on more of Jess’s workload, transitioning to a subscription list of own with built-in reminders for ourselves and subscribers. Memo: know what each element in a subscription list references and update regularly. Three projects were underway and we needed to decide what was possible in thirteen weeks. We needed to make a realistic plan and manage our schedule in such a way that organising another launch so soon after the last was a reality. Gaining momentum but running out of time, we launched our first three projects. The launch’s timing matched this book well in terms of marketing, key dates and attention to detail. Memo: keep track of each project’s timing and be realistic about what’s possible. Launches are where you can get to meet people who worked on, contributed to and are excited about seeing your book printed. It makes the whole process feel real in a way that pouring over material, often alone, doesn’t. Thanks to everyone in the team in-house and out. I’ll certainly never forget the great experience. I was sitting third row from the front at Federation Square’s Edge Theatre during a session of the Melbourne Writers Festival. Yassmin Abdel-Magied was talking with Amani Al-Khatahtbeh, Min Jin Lee and Micah White about what is was like to live in America under the presidency of Donald Trump. Part way through the session my concentration drifted away from the hotly contested political debate through the large glass panels that formed the space and towards the vision of the city of Melbourne that sat beyond. The blue sky, the green trees, the brown Yarra, were all there and it was all familiar. At that moment events in America could not have felt any further away. Instead, what I saw of Melbourne reminded me I was in a singular place filled with its own thoughts, conversations and debates. Melbourne was named a UNESCO City of Literature in 2008. It was the second city in world given this title after Edinburgh. Melbournians regard their city as Australia’s cultural capital and this title certainty backs up that reputation. As does the number of bookshops and books, magazines and newspapers sold here, more than in any other city in Australia. Cities of Literature, as part of UNESCO’s Creative Cities Network must commit to various was of facilitating, integrating and disseminating cultural activities. The aims of UNESCO’s Creative Cities Network may seem dry and too bureaucratic. They seek to promote the creative and cultural industries within a development model locally and as a form of inter-city cooperation internationally. Yet, under these broad notions are several organisations including The Wheeler Centre, Melbourne Writers Festival and Writers Victoria that provide an outward looking connection between literature at an institutional level and those who write, read and engage with it. The Wheeler Centre does this by creating a physical focal point where the isolating acts of reading and writing can become spaces for socialising and networking. It takes up a corner of the State Library of Victoria, a building I pass several times a week. I often cross the narrow Little Lonsdale Street, which leads to the entrance to the Wheeler Centre. I take in the solidness of the entire nineteenth century State Library building and wonder how buildings from that era have permanence more contemporary structures can’t replicate. I pass the green lawns and watch the tourists take photos, the couples lay on the grass in each other’s arms and the office workers enjoy their lunch breaks. I move pass the sculpture of the library sinking into the ground and make my way to RMIT. The publishing scene in Melbourne is alive and healthy. There have been dark moments in recent years with the collapse of REDGroup closing Borders and Angus & Robertson bookshops, and there was the rise of the ebook sending print book sales into freefall. Fortunately, sales have somewhat recovered and independent and specialty booksellers have grown out of the REDGroup rubble. Lead by Readings, which was named Bookstore of the Year at the 2016 London Book Fair. Things are not just good if you are reading and selling books. There are many publishers in Melbourne, from the big players like Penguin Random House and Harper Collins, to independents like Scribe and Black Inc Books. Melbourne is also home to literary journals including Meanjin Quarterly, The Lifted Brow and Kill Your Darlings. And there’s Sticky Institute who have got any zine needs covered. Bowen Street is a pedestrian only thoroughfare that allows students access to many of the buildings of RMIT’s city campus. I head to the second level of one of these buildings and enter a space that looks like the set of the 1990s science fiction television show. This room is the home base of the Bowen Street Press. Where RMIT masters students work together to contribute to Melbourne, City of Literature. We are writers, editors, production managers, marketers and designers. We make zines, anthologies and literary journals. The Bowen Street Press is built out of Melbourne’s love of literature. It is a small press in a city where small presses thrive. It is student-led operation built out of RMIT’s internationally renowned editing and publishing courses. Students who are engaged with literature run the Bowen Street Press. We are all readers, we attend writers’ festivals and we all buy books. Literature feeds our sense of what Melbourne is. It is the muddy Yarra River, the busy streets of the Hoddle grid, the grand library and the fine universities. We make books and we read books symbiotically with the Melbourne that surrounds us. Making sure to never forget that this city is forever part of who we are and what we do.